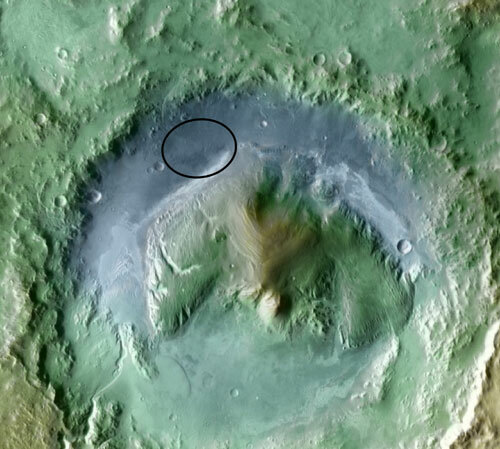 According to Nature News, Gale Crater has emerged as the top landing site candidate for the next Mars rover. "Gale Crater, a 150-kilometre wide depression named after an Australian banker-turned-amateur astronomer, has emerged as the preferred destination for the next spacecraft to set wheels on Mars. The proposed landing site, which includes a tantalizing 5-kilometre-high mound of ancient sediments, may have once been flooded by water. Nature has learned that it rose to the top last month following a secret ranking of four candidate sites by co-investigators working with NASA's Mars Science Laboratory, a 900-kilogram rover dubbed 'Curiosity' set to launch later this year."